Looking to Leave Your Cartel? 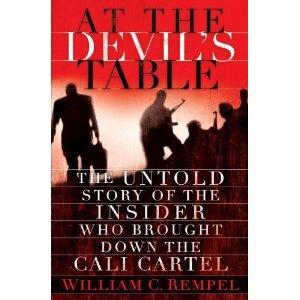 Recently I read “At the Devil’s Table” by William C. Rempel. This is a terrific non-fiction book that reads like a novel. Rempel’s book tells the story of Jorge Salcedo, an engineer, who is recruited by the godfathers of the Cali Cartel to oversee operations to take out Pablo Escobar. Salcedo agrees to help the Cali Cartel in the belief that he is doing his country a service. It is not too long before Salcedo has gotten himself into something he may not be equipped to handle. He wants to leave his “employers,” but there is only one way to leave your job with a cartel. That’s right…dead, not alive. Salcedo provides security for the cartel and this provides the one way he might be able to get out —by helping U.S. Federal agents capture the godfathers. The story of Jorge Salcedo’s deception is fraught with close calls, tension in conversations with godfathers, and periously dangerous situations for all those involved (even his and other cartel member’s families). One other tidbit for my readers: I became very interested in cartels and their opertations and wondered how similar the Mexican cartels were in their operations. I found some great information in a CRS Report for Congress. This is one of the great benefits of reading of all kinds, it leads you to explore a subject further. The internet has become a great tool for actually viewing the locales you are reading about or seeking more information. Take a look at the CRS report – it is much more interesting that you might think! Back to Rempel’s book – this is a great summertime read. It gives insight into Columbia in the 1990’s, the Medellin Cartel, the Cali Cartel and the corruption these organizations spawned in the South American country of Columbia. An insider’s view of a world I hope never to experience first hand! Book Details: Published by Random House (June 21, 2011), 368 pages, ISBN: 1400068371. I just finished the book I’m reading. Now I wonder if I should rewrite my to read list and put this one at the top.